Betterment and Personal Capital are pioneers since the early days of the robo-advisor industry but the similarities end quickly because they contrast starkly across key factors, like fees, tools, and human advice. Betterment began life as a pure robo-advisor. If you wanted a technology-powered algorithm to manage your money at low cost, Betterment was the place to go. Over time, Betterment expanded from offering digital advice only to include human advice. It improved its service by adding tax-loss harvesting, tax-coordinated portfolios, and socially responsible investing portfolios. Personal Capital took a different approach from the outset by pairing investors with dedicated human advisors. You got all the benefits of a robo-advisor along with human oversight, but at a higher annual cost. Personal Capital also developed a world class mobile investment app, so you can view your day-to-day spending as well as your investments all in one place, and manage your budget while on-the-go. Each offers enormous value to clients but when comparing Personal Capital vs Betterment, which is the best robo-advisor? Which Robo-Advisor Is Best For You: Personal Capital or Betterment? Over 1.8 million people use Personal Capital to track over $550 billion using its mobile app, which is world class. The mobile app is available to all users, so you don’t have to be a Personal Capital investment client to track your spending, manage your budget, view your assets and liabilities, and monitor your investment accounts. It’s free to all users. The “catch” when using the Personal Capital mobile app is the company gets to see your entire financial life and will invite you to consult with a dedicated financial advisor if you meet the minimum account levels to invest. In our experience, the “up-sell” is not intrusive and feels more like an invitation that you can politely decline or accept. Once you start using the mobile app, you will find that it is very well designed and may hook you. Don’t be surprised if you find yourself logging in daily to view your net worth, track your spending and keep tabs on loan balances. If you choose to invest at Personal Capital, you will experience a white-glove service. You can think of Personal Capital as the luxury robo-advisor that holds your hand every step of the way by pairing you with a dedicated financial advisor as opposed to a team of live advisors or financial experts. The fees you pay will be steeper than those charged by many top robo-advisors – you pay for the higher level of personal service. Personal Capital charges 0.89% annually on assets managed. Still, you pay a good bit lower than what the average financial advisor charges and you get a whole lot more bang for your buck. Betterment began as the low-cost robo-advisor but has continually improved its offering over time to cater not only to customers who want pure digital advice but also to those who seek access to Chartered Financial Professionals. As an early robo-advisor pioneer, Betterment has taken full advantage of its head-start over new up-and-comers by developing ever more tools and services to add value to customers. You can even donate to charity automatically via the Betterment platform. Want to avoid so-called “sin stocks” that produce tobacco and alcohol? Or side-step companies with questionable track records of protecting customer data? Maybe you want to steer clear of companies that have polluted the oceans following oil spills? Check. Check. Check. Betterment has you covered on all fronts with socially responsible investing portfolios, known as SRI portfolios. Are you fee-savvy and tax-aware? Betterment charges some of the lowest fees among all robo-advisors and has one of the most comprehensive tax-advantaged setups in the industry, featuring not only tax-loss harvesting service but also tax-coordinated portfolios. If you have an eye on retirement, Betterment delivers calculators, guides and tools to help you assess where you sit and what you need to do to reach your financial goals. Personal Capital fees range from 0.49% to 0.89% but for most investors with less than $1 million, the higher fee will apply. Betterment fees start at 0.25% for its pure robo-advisor service and increase to 0.40% for a hybrid service that includes human advice. Betterment imposes no account minimum to get started, so if you want to try out its service the hurdle is low. When you deposit money, you will be charged 0.25% for Betterment Digital, its pure digital advice service. Fees remain at 0.25% of assets managed as you deposit more money, so you know you are getting rock bottom pricing no matter how much or little you invest. If you want access to human advice, Betterment does make available Chartered Financial Professionals to customers of its higher tier service, Betterment Premium. However, you will pay a bit more for this service – it costs 0.40% annually. Personal Capital is more expensive from the get-go. It costs 0.89% up to the first million dollars deposited. To qualify for a Personal Capital account, you need to deposit at least $100,000 so if you have less, Betterment is your only option. Take note however that Betterment also imposes a $100,000 minimum for its higher tier service, Betterment Premium, but anyone can get started with Betterment Digital, which provides digital advice only. The fees at Personal Capital decline on a sliding scale all the way down to 0.49% but you will need to pony up a hefty $10 million to qualify for its lowest rate. So what do these percentage charges mean in terms of how many dollars come out of your pocket? Betterment Fees or Personal Capital Fees: Which Robo-Advisor Wins? Betterment is about half the cost of Personal Capital for equivalent service. For a pure robo-advisor service, Betterment is the only choice and charges fees in line with industry norms. Clients at Personal Capital are paired with a dedicated financial advisor and if they deposit over $200,000 they have access to two dedicated financial advisors. Betterment clients can connect with a team of Chartered Financial Professionals. Both Betterment and Personal Capital provide human advice in addition to algorithmic, computer-powered money management services. Where they differ is that Personal Capital pairs you with a dedicated financial advisor while Betterment connects you to a team of Chartered Financial Professionals. Personal Capital also goes a step further by examining your complete financial picture. Leveraging its mobile app, Personal Capital can view much more than your investment accounts to get a holistic view of your financial circumstances. By examining your day-to-day spending habits, savings rates, assets and liabilities, Personal Capital can construct a tailored portfolio. Personal Capital Vs Betterment: Which is Better for Human Financial Advisors? If you don’t need or want the extra hand-holding and feel comfortable simply knowing a financial expert is accessible when you need one then Betterment can save you money but if your financial situation is more complex, or a more personalized approach suits you better, Personal Capital is the way to go. Betterment and Personal Capital use ETFs in portfolios that are built on the foundations of Modern Portfolio Theory. Above $200,000 in assets, clients have access to individual stocks at Personal Capital. Like most robo-advisors, Betterment and Personal Capital rely on Nobel-prize winning research, called Modern Portfolio Theory, to build diversified portfolios for clients. Low-cost exchange-traded funds, or ETFs, are used by both robo-advisors, though Personal Capital will use individual stocks also for clients with portfolios over $200,000. This process is called Smart Indexing and allows Personal Capital portfolios to mimic an ETF by grouping a collection of individual securities that can then be sold or replaced to lower taxes. Betterment exclusively uses exchange-traded funds with expense ratios that range from 0.09% to 0.17% and include up to 12 asset classes. Retirement Planning & Financial Goals: Should You Choose Personal Capital Or Betterment? It’s a virtual tie between Personal Capital and Betterment on investment strategy because both rely on the same Nobel-prize winning research to build diversified portfolios that match client risk profiles and financial goals but Personal Capital squeezes out a narrow victory thanks to its Smart Indexing (also known as Smart Beta) approach. As top robo-advisors, both support tax-loss harvesting and look to allocate assets optimally across taxable and tax-advantaged accounts. Betterment has a keen eye on tax-efficient investing. Beyond tax-loss harvesting, which looks to lower capital gains taxes by offsetting losing positions against winning positions, tax-coordinated portfolios are used by Betterment. A tax-coordinated portfolio is designed to place tax-efficient assets in tax inefficient accounts and tax inefficient assets in tax efficient accounts. For example, municipal bonds are already tax-advantaged so there is no reason to place them in a tax-efficient account, such as an IRA or 401(k). Personal Capital also strives to place assets in taxable and tax-advantaged accounts based on their taxable impact. Personal Capital vs Betterment: Tax Loss Harvesting? Betterment and Personal Capital tie on tax strategy because both optimize for taxes within taxable accounts using tax-loss harvesting as well as across accounts based on the tax impact and tax efficiency of assets and underlying accounts. Both robo-advisors support a wide range of accounts, including taxable and tax-advantaged accounts. Personal Capital will also advise on 529 Plans and 401(k) plans, though it won’t manage either. Betterment wins on fees, a lower account minimum, range of services, and retirement tools while Personal Capital wins for its mobile app, dedicated financial advisors and tax strategy. ✅ Human Advice: Personal Capital clients are paired with dedicated financial advisors, and clients with assets over $200,000 are assigned to two dedicated financial advisors. ✅ Portfolio Management Fees: Betterment wins with low fees of 0.25% for Betterment Digital and 0.40% for Betterment Premium, a hybrid service that includes human advice via Chartered Financial Professionals. ✅ Tax Strategy: Both robo-advisors do an excellent job on tax strategy, though if we had to pick one, Personal Capital would get the nod simply because it employs Smart Beta or Smart Indexing using individual securities as opposed to ETFs alone. ✅ Account Minimum: Although both Personal Capital and Betterment have high minimums of $100,000 for clients who want access to human advice, Betterment is the clear winner for solely digital advice because it imposes no minimum to get started. 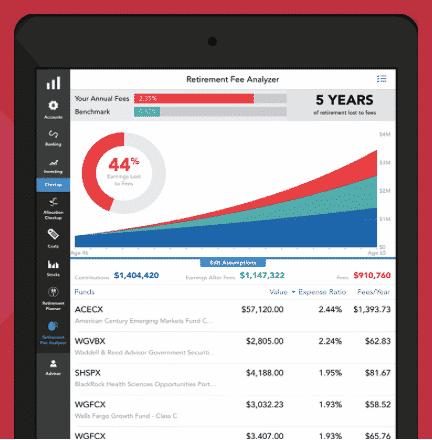 ✅ Mobile App: Clients and non-clients alike can take advantage of Personal Capital’s world class mobile app, which will track your budget, spending, savings, investments, assets and liabilities in an easy-to-use interface. ✅ Goal Setting: Betterment relies on behavioral investing to help clients set financial goals and stick to them – plus you get the option to sweep unused cash into accounts that are dedicated to certain financial targets, such as saving for a new home or a car. ✅ Tools: Clients enjoy a 401(k) fee analyzer as well as a budget tracker to monitor expenditures at no extra cost. ✅ Retirement Planning: RetireGuide is a tool at Betterment that links to outside accounts and tracks how savings and financial objectives match to make sure you are on target with your financial aspirations. ✅ Fractional Shares: No cash is left idle at Betterment thanks to its fractional shares feature, so you can be confident that your money if fully invested. Betterment has long been regarded as one of the top robo-advisors but Personal Capital offers stiff competition. For investors with less than $100,000 to invest, the only option is Betterment because Personal Capital imposes that as a minimum. If you can meet that hurdle, you will pay higher fees at Personal Capital than at Betterment but you will also enjoy a higher level of service when paired with a dedicated financial advisor. If your circumstances are more complex and access to human advisors is important, Personal Capital may be the better fit, and you will also get the bonus of a robo-advisor who has a clear focus on optimizing the all-important after-tax returns. 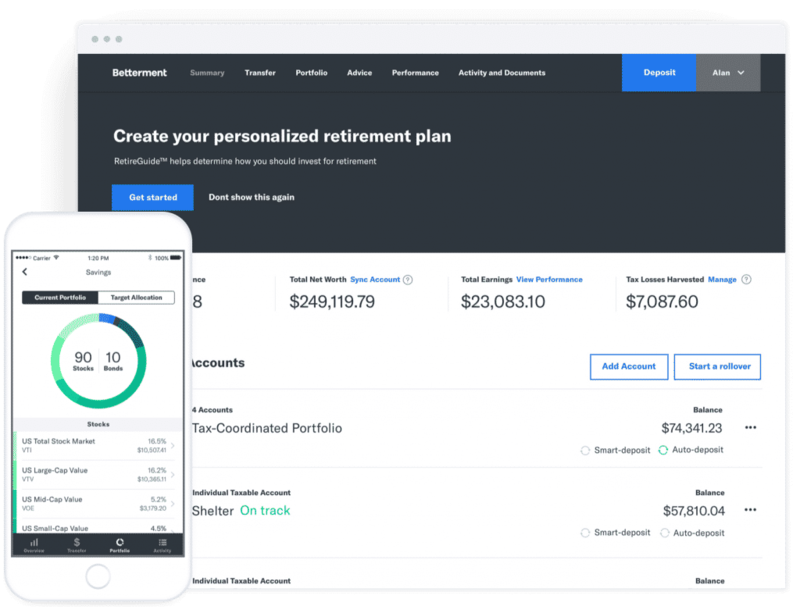 Betterment has a wide range of tools and calculators to help you stay on track to meet your financial goals while Personal Capital has an excellent mobile app to track budgeting, spending, and investments. So, which is better when comparing Personal Capital vs Betterment? It’s a close call, but Betterment gets the nod overall because of its lower fees and account minimums.